-Read the excerpt below from Matthew Balan's Media Research Center's post. By contrast, NBC Nightly News and CBS Evening News on Tuesday both devoted air time to the 50th anniversary of the 1964 World’s Fair in New York City. BRIAN WILLIAMS: The temptation to compare William and Kate to William’s own parents today became unavoidable, as the young couple, in the midst of their tour of Australia, posed in the exact same spot as Charles and Diana did 31 years ago. Today found the royal couple in the heart of the Outback, at the golden hour of the setting sun in front of the brilliant red rock – a vista Prince William declared ‘breathtaking.’ They celebrate their third wedding anniversary next week. The NBC evening newscast aired a two minute and 52 second report on the anniversary of the World’s Fair in the Bronx. Correspondent Harry Smith did a retrospective on some of the features of the exhibition, and zeroed in on some of the preservation efforts at the site. On CBS Evening News, anchor Scott Pelley gave a 30-second news brief on the World’s Fair’s anniversary. While Pelley didn’t cover the British royals’ Australia trip, the last segment of his newscast, which lasted one minute and 51 seconds, spotlighted an elementary school student’s efforts to get the woolly mammoth declared the state fossil of South Carolina. The following morning, CBS and NBC’s morning shows, along with ABC’s Good Morning America, did cover the IRS story. Anchor Tamron Hall devoted a 31-second news brief to the issue on NBC’s Today, while correspondent Nancy Cordes filed a two minute and 25 second report to the agency’s bonuses to tax cheats on CBS This Morning. 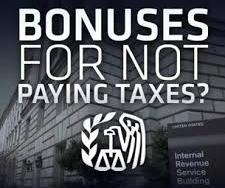 DIANE SAWYER: And in other news today, right after the tax deadline for so many of us, tonight, we are learning that some of the taxpayer dollars sent in had been paid to IRS agents who did not pay their taxes – and even so, were rewarded with bonuses. So what is going on here? ABC’s Jeff Zeleny is on our watchdog beat in Washington tonight. JEFF ZELENY (voice-over): If you don’t pay your taxes, the IRS will come after you – unless you happen to work at the IRS. Tonight, a new watchdog report reveals the Internal Revenue Service handed out more than $1 million in bonuses to employees who were delinquent on their federal taxes. GREGORY KUTZ, ASSISTANT INSPECTOR GENERAL, TREASURY DEPT. : Certainly, someone that’s an egregious tax offender working at the IRS probably shouldn’t be getting a performance reward. ZELENY (on-camera): Sounds like common sense. KUTZ: I would agree with that. ZELENY(voice-over): The report finds more than 1,000 IRS workers, who didn’t pay their taxes, received not only cash bonuses, but extra time off – to the tune of 10,582 hours – valued at $250,000. Sixty-nine employees even got raises – all funded with the taxes you pay. If you’re outraged, you’re not alone. UNIDENTIFIED WOMAN: I’m absolutely appalled. UNIDENTIFIED MAN: Just so many stupid things go on in our country. ZELENY (on-camera): This report is shining a new light on the staggering amount of bonuses received by so many employees here at the IRS. ZELENY (voice-over): In 2012, the agency doled out $86 million in cash. Tonight, the IRS acknowledges there’s work to be done, saying ‘We strive to protect the integrity of the tax system, and we recognize the need for proper personnel policies.’ The inspector general offered this suggestion: no bonuses for employees who don’t pay their taxes. 1. What type of bias did NBC and CBS nightly news displayed by ignoring the IRS scandal on their evening news reports? 1. NBC and CBS nightly news displayed bias by omission and story selection for ignoring the IRS scandal on their evening news reports.